Is it just me? I love to have a large selection of random music on my MP3 player, and also on my phone. I usually make up a playlist of 4GB or so (that'll last me weeks) selected at random from my large music collection of about 50GB. The problem is that every couple of years the method of automatically getting a selection like that fails and I have to work it all out again. I had a nice script once a few years ago, adapted from someone else's work, that I simply ran in whatever the current file manager was at the time (not the current one). Of course, when the file manager changed the script failed. I then had some random selector program written by another, but that went the same way. I've recently been using MrRandom, but that went very flaky during Mint 17 and with the update to Mint 18 it would only load about half a dozen songs and then keep stopping, so I was hammering the mouse to try to reach the target size. MrRandom seems to be no longer supported. I'm now on Mint 19 and my music is on a separate 2TB USB drive that I have to plug in to my laptop (only at my desk! ), so I could do to load a 4GB folder on the laptop to keep it portable again. I can't seem to find a suitable program any more that will work, and with my advancing age I'm not as good at writing scripts as I used to be. Just can't keep the attention up long enough, and keep forgetting things. 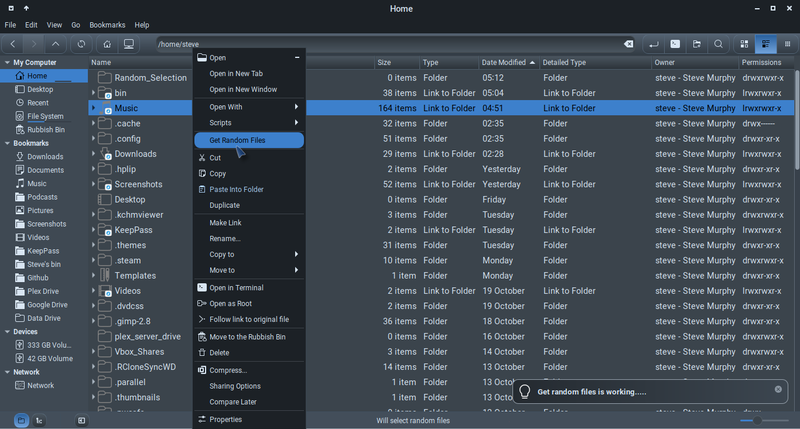 So, SUGGESTION: Why not add a neat little extra to the current file manager which would do this? It could be used for other things than music. For instance I could build a file of photographs which could be used on the desktop (I have again many many GB of those). Random podcasts anyone? How about random something else? Last edited by momist on Fri Nov 23, 2018 12:08 pm, edited 1 time in total. Re: Who likes random music on their player? The default music player for Mint 19 - Rhythmbox has a shuffle option. If you activate it, highlight all albums and press play - you have random music. You can also do podcasts. Thanks smurphos, but as far as I know, it doesn't allow you to take some (say 1GB, or maybe 400 tracks) of that random selection, and transfer them to my phone, or to my MP3 player, or to my laptop. The 50GB I have is on a separate USB HDD that is used only when needed. I generally use VLC player the way you suggest. Sorry I misunderstood (read - didn't read properly ) your post. It shouldn't be hard to make a script to do this. What version of Mint and which Desktop Environment are you using? The three DE's all have different file managers. This will copy 400 random files from the current folder to /media/MP3PLAYER. Adjust count and path(s) as needed. @smurphos No worries. I'm using Mint 19.0 Cinnamon. Laptop with 30GB / and 38GB /home on SSD. @gm10 Thanks. When I'm feeling more clear headed, I'll think my way through that, if I still can. @Pepi. Yes! I sometimes go for a whole album, but very rarely. I can rock through a Pink Floyd, or sometimes some folk and only folk, or classical. But usually I prefer random. Everyone: I have two music players, a magic cube and a very old Sansa Clip. Neither of those have 'shuffle' on them, and the cube doesn't open folders, everything has to be on the root. A random set from my collection onto my phone would be good too. 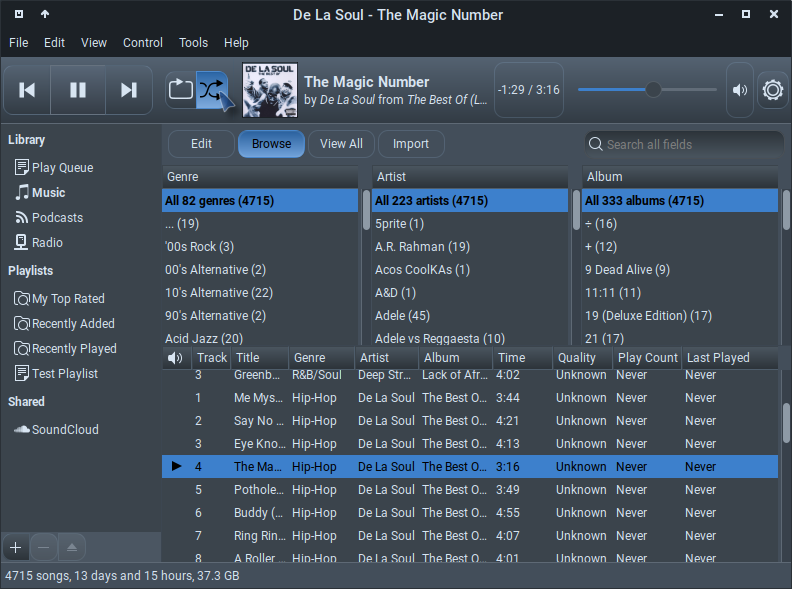 I also want to put a random music set off the USB drive into the ~/music folder on the laptop, so I can use it anywhere. I only have 38GB for /home. I'd also like to put a random few hundred photos out of my large (100GB or so) collection onto the laptop to use as desktop background. The idea is to change these random selections, maybe once a month or so. The simple answer to all these is to have a simple script that moves, say 400 files selected at random from a folder on the USB drive, into an empty folder on the laptop. From there it's simple to put them wherever I need them. Of course, the laptop answer is to install a 2TB HDD in there, which may happen next year when I've saved up a bit. Who likes random music on their player? Like you I have tons of music in multiple genres. Building on gm10's timely example here is a small script and accompanying Nemo custom action which adds a right click option in Nemo to 'Get Random Files'. Nemo is Cinnamon's file manager. To see the right click option you need to click on a target folder and right click, or whilst in a target folder right click on empty space in the pane. As written it will get 400 random files from the folder and any subfolders and copy them to $HOME/Random-Selection. Amend the script TARGET and NUMBER variables to change this. This folder is deleted and recreated each time it is run so after running the script you will want to move it or it's contents to the desired final location. You will get a notification at job start and job end. The script - save this as ~/bin/get_random_files.sh and make executable. notify-send --expire-time=100000 --icon=dialog-warning "Cannot run get random files whilst another instance is running!" notify-send --expire-time=100000  "Get random files is working....."
notify-send --expire-time=200000  "Your random files are in $TARGET"
Since I'm already involved, may I suggest this change to your script for interactive output directory selection? Minus your target removal code, of course. Of course you may gm10. I've also added a zenity entry to choose the number of files. i don't think there is any need in this version to prevent multiple instances. Version 2 - requires zenity to be installed - apt install zenity. On right click on a selected folder will ask the user to select a target directory and a number of random files to copy. Version 2 script - save this as ~/bin/get_random_files.sh and make executable. notify-send --expire-time=100000  "Get random files is working." Comment=Will select random files from target folder and copy them to a folder of your choice. I've found a 'work around' using the music player 'Clementine'. This will happily assemble a random playlist from my music selection into any target destination I choose, ready to transfer to my other device, or even direct to that device. The only drawback is that it then assembles them there in folders dedicated to a single artist, so they the device then plays all tracks from one artist followed by all tracks from the next etc.. Actually, I can tolerate that restriction for a while. I am still looking for a definitive answer though, as this solution is only applicable to my music, and not to any other kind of file. Most/all music players can do that. I use gmusicbrowser and it allows you to copy files from the randomly generated playlist anywhere as well - without creating folders. Please accept my apologies to all on this thread. My thanks and particular apologies are extended to smurphos and gm10 for their gallant efforts on my behalf. The script provided works excellently well, and gives me all that I need for the selection of both music and photographs from my external hard disk to generate a large, but not too large, randomly organised file on my SSD for my listening pleasure and also for desktop backgrounds. It provides a suitable varied random file for transfer to my music player and my phone. All I have to do now is remember how to use it! I'll write myself a note in the laptop to remind me of he process. The reasons for the delay in implementation lie in both my social life and family responsibilities, and also in the increasing difficulty I am having in concentrating for long enough to follow through on any complex sequence of actions. I am finding more and more that old age is restricting my abilities, but today seems to be a good day for me.